Phonics Worksheets from Phonics Hero - 250 Free Worksheets. 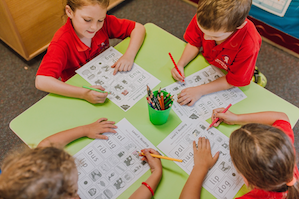 Included in your free Teacher Account is access to 220 free phonics worksheets to use as a whole class, a reading rotation activity or homework. For every level, there are 12 phonics worksheets covering each skill that Phonics Hero teaches. These are intended to be teacher/parent led. Say a sound and children identify the correct letter(s) by circling/colouring. As an extension children give a word which uses the target sound. To differentiate there are ‘supported’ and ‘independent’ worksheets. Many schools use the supported worksheets when the class are blending with new sounds and then the independent once they are confident. The supported worksheets also include sound ‘buttons’ (a single letter sound indicated by a dot and a dash to indicate a digraph/trigraph) to support children in identifying the grouping of letters. The supported worksheet includes boxes to show how many sounds are in the word. The independent worksheets allow children to go it alone! Note, the answers are included so you don’t get stuck guiding the children! Every child loves a word search! Hunt for the hidden camera/tricky words, they can be horizontal or vertical. As an extension, children can find the extra word or write a sentence using the target words. Follow the three step process to spell these tricky words: spell the decodable part of the word, identify the tricky bit and then spell the whole word. The supported sheet has children reading a caption/sentence and deciding if the picture matches. The independent sheet has children identifying the picture from an array. The camera/tricky words are bolded to indicate that these words are trickier.